The total lunar eclipse on March 3 2007 will be visible over the eastern Americas, Europe, Africa, and western Asia. So here, to celebrate, is An Overgrown Path exclusive on a lunar story that has fascinating musical connections. 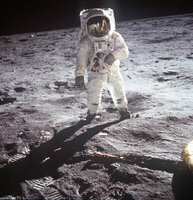 Notoriously taciturn first man on the moon Neil Armstrong reveals his choice of fly-time music in a recently published book. And his musical tastes open up undreamt of connections to Russian government research projects, Soviet agents and Communist propaganda films. Moon Dust by Andrew Smith is a new study of how the lives of the Apollo astronauts were changed by their lunar experience. Most of the nine surviving astronauts agreed to be interviewed for the book, but true to form the first man on the moon did not. But in an email exchange Armstrong identified the cassette of ' strange electronic-sounding music' that fellow Apollo 11 astronaut Michael Collins had reported him taking to Luna. The cassette in question was transcribed from Neil Armstrong's own LP of Music Out of the Moon featuring Dr Samuel Hoffman. 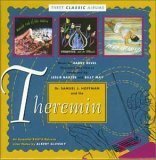 Author Andrew Smith decribes the theremin played by Hoffman on this album, and gives a short history of this unique instrument which mainly relates its use in rock music. But he completely misses out on a fascinating Russian connection. The story is too good to miss, so here it is. The theremin was an early electronic instrument invented by a young Russian physicist called Léon Theremin, and came about as a side-product of Russian government-sponsored research into proximity sensors shortly before the outbreak of the Russian Civil War in 1919. The theremin (left) is the original 'hands free' instrument and requires no physical contact from the player. The player moves his hands close to two antenna, the right hand controls the pitch and the left hand determines volume. A variety of effects can be produced ranging from glissandi to staccato, but the instrument needs to be played from memory as notation is impossible. The invention was enthusiastically received in Russia, and was personally demonstrated to the Bolshevik leader Vladimir Lenin who went on to take lessons. But America won the ideological struggle and Léon Theremin moved to the US where he patented his invention, and it was put into production by RCA with limited success. But fact then gets stranger than fiction. Theremin was alledgedly kidnapped from his Mannhatan apartment by Soviet KGB agents who returned him to Russia where he was imprisoned for years, apparently for political reasons. After his release Theremin developed military and espionage devices for the KGB (logo to right), before going to work at the Moscow Conservatory of Music, where he built theremins and taught music for ten years. He did not return to the US until after the collapse of Communism. Shostakovich's second film score Odna (1931) uses a theremin among the huge orchestral forces. The film was made shortly after the declaration of Stalin's first five-year plan, and it embraces the positive aspects of Communism including teaching, collectivism and modern technology. The theremin had other exponents in the classical field, most notably Clara Rockmore who was famous for her transcriptions for the instrument which included Bach and Bloch's Schelomo. Mrs Rockmore's recording of the Concerto for Theremin and Orchestra by the American composer Anis Fuleihan conducted by Leopold Stokowski has been reissued on CD, as has her The Art of the Theremin which was produced by Robert Moog in 1977. The Ondes-Martenot, which was invented in 1928 and used so effectively by Olivier Messiaen, as well as Pierre Boulez, Edgar Varèse, Darius Milhaud, Arthur Honegger, Bohuslav Martinů and André Jolivet (who wrote a concerto for it in 1947), is a cousin of the theremin that uses similar heteroyne oscillators controlled by a keyboard. 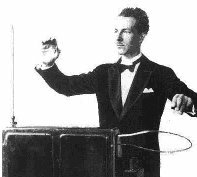 The theremin was popular in America for a time after the Second World War, but it was then eclipsed by the new generation of electronic instruments. The best known of these is the Moog synthesizer, whose inventor Robert Moog started his career selling theremin kits. Despite technology improvements the theremin continued to have its advocates. 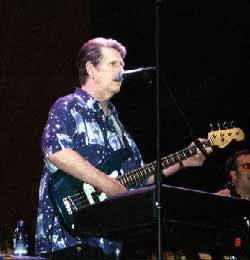 These included Brian Wilson (left) who had to accept a hybrid Electro-Thermin for the recording of the Beach Boy's 'Good Vibrations' in 1966 due to the non-availabiltiy of the real thing. Three years later the best selling album 'Led Zeppelin ll' featured a theremin solo on the opening track 'Whole Lotta Love'. The other-wordly sound palette of the theremin makes it a natural for film scores. Probably the best known film appearance is in Bernard Herrmann's 1951 score for The Day the Earth Stood Still. The unusual scoring is for a small orchestra combining the acoustic and electric sounds of brass, reed organ, Hammond organs, pianos, percussionists, electrically amplified strings, and cello, and bass and two theremins which play in opposition to create disorienting swirls. Dr Samuel Hoffman, who recorded the theremin album which started us down this fascinating Overgrown Path, was an American chiropidist turned musician. He met Léon Theremin while playing in a dance band in the 1930s and became an enthusiastic exponent of the electronic instrument. Among Dr Hoffman's claims to fame are playing the theremin part in Miklós Rózsa's score for Hitchcock's Spellbound. His Music Out of the Moon is a Capitol album dating from 1947, and was written by classically trained light music composer Harry Revel, with arrangements and conducting by easy listening king Les Baxter. Now read about contemporary music for the theremin, and about the early music that travelled on the Voyager space craft. And if you want to try this at home.